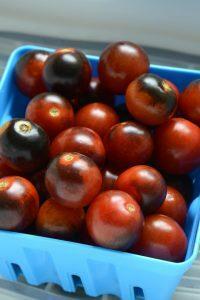 Trendy blue tomatoes in a cherry size, bred for balanced flavor and earliness. Indeterminate vines should be staked and will keep pumping out the snacks for months. AAS winner for 2017, the judges were excited about the improvements over earlier indigo tomatoes.